Garden roses – a group that included wild, decorative, garden hybrids and varieties. They are put in gardens, parks, used for decorating walls, fences, combined with other ornamental plants. Plant roses in early spring or autumn, a place to land need to choose well lit. You can not plant roses in shaded areas, under trees, in such circumstances, they will get sick and suffer from insect pests. Soil for plants should be prepared for a couple of weeks before planting. 1 square meter is necessary to make 4-5 kg of manure. The roots of roses should be freely accommodated in the holes for planting. Placing the plant in the hole, it should be covered with soil, tamped and watered. Garden roses need abundant watering. Especially much water the plants need during intense development in the spring, in June and early July. During dry weather without rain roses need to be watered several times a week. The soil should be impregnated with moisture on two feet. Watering roses need in the evening, trying not to wet the leaves as this can cause disease. With the onset of autumn watering should be stopped, they will lack precipitation. If the autumn is very dry, should be watered moderately roses to winter they are not left without moisture in the roots. 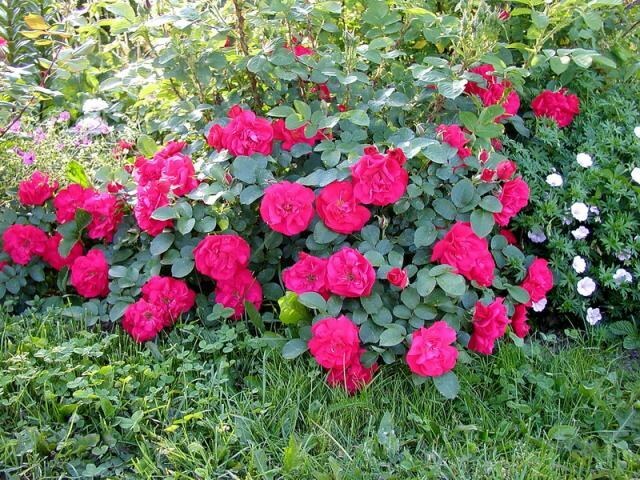 In the spring, roses should be fed with fertilizers. This will require to be dissolved in 10 liters of water 20 grams of ammonium nitrate, 30 grams of superphosphate and 10 grams of potassium salt. One hive will need 5 liters of solution. After fertilizing the plants should be well watered. A positive effect on the growth and development of plants mulching. Mulch the soil around the Park of roses need peat, hay or decomposed manure. The next feeding should be carried out when the leaves are in full bloom. To do this, dissolve the fermented mullein water in a ratio of 1:10. Each shrub should be watered 5 gallons of solution. The third time the roses need to be fed during the buds. In 10 liters of water should be diluted 30 grams of superphosphate and make under a Bush 3 liters of this solution. Adult rose bushes should be annually cut as soon as you start to blossom buds. You need to remove diseased, dried, broken branches. In late August or early September, the young shoots can be cut from the top 5 centimeters for better ripening of shoots and good winter hardiness. If the bushes had grown quickly, and have less bloom and acquired a slovenly appearance, should conduct renewal pruning. To do this, remove the oldest stems and branches growing inside the Bush. The slices should be lubricated with garden pitch. In the year following pruning rose forms a new strong shoots. Many garden roses quietly tolerate the winter, but for young plantings, and some varieties need shelter. To protect the plant, it should be Spud at the base, and the Bush to wrap several layers of Kraft paper. If it is not possible to buy paper, use burlap or felt.